I completed this project in June, ’08. It was part of a fund-raising activity supporting our local animal shelter, the Friends of Strays. 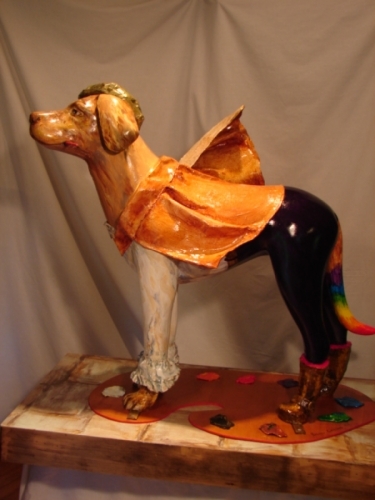 Many artists submitted designs for painting a fiberglas dog or cat, and mine was sponsored by the Prairie Art Center in Princeton, IL. 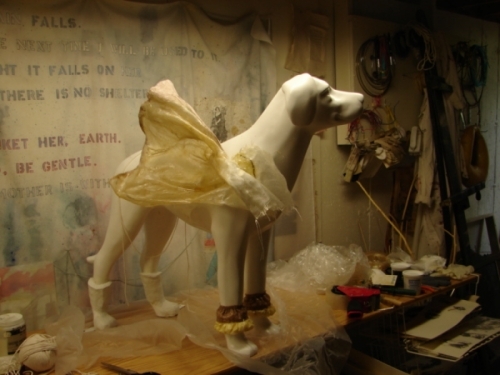 I used to teach plastics in the graduate school at Pratt Institute in Brooklyn, and used fiberglas laminations (many, many laminations…), epoxy pastes, acrylic modeling paste, two-component urethane resins, and commercial auto body fillers to build the forms that I attached to the dog I was given. 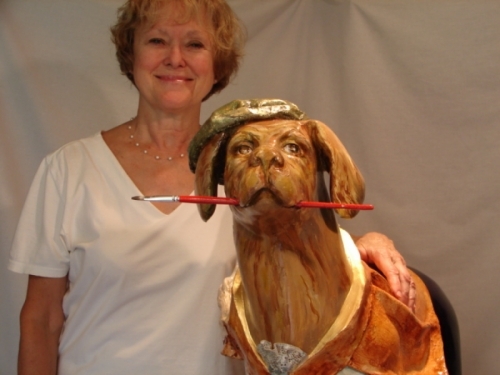 The idea came from trying to attach the name of an artist to the fact of the dog. 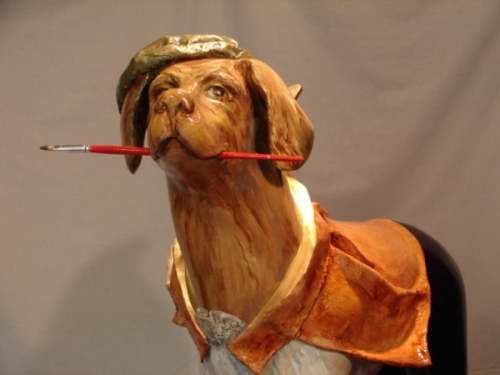 I realized one morning that a simple “g” could change Leonardo da Vinci (shamelessly, on my part) into Leonardog. I used Golden Acrylics (which I had never worked with before, and found very difficult at first because they do not use the traditional primaries) (but they prooved marvelously strong and dense paints), and a UV block. 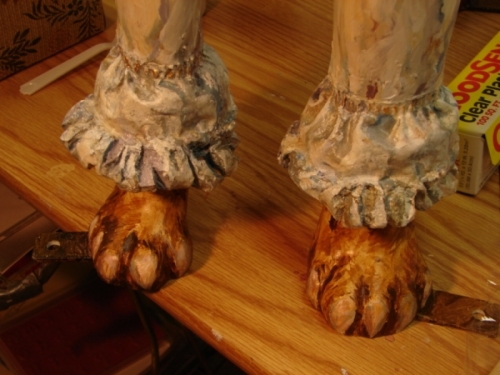 I had added various Renaissance touches using epoxy paste and more fiberglas - the boots, cuffs, the cap. Then put the color spectrum on his tail. I used a long drill to make both holes at once, and then inserted an old paint brush, and sealed it all up with epoxy paste. 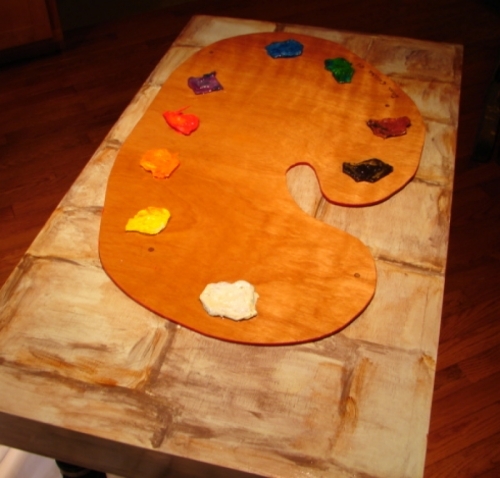 I used my scroll saw to cut the palette from a piece of mahogany, then sanded, stained, and urethaned it. 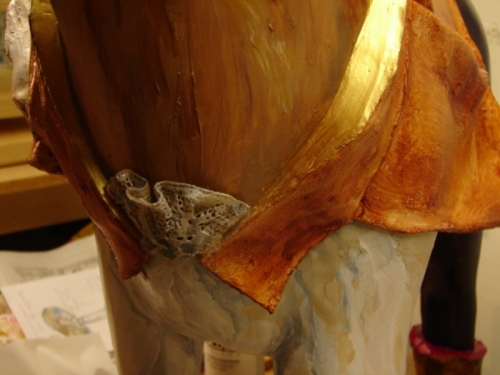 I made separate fiberglas cloth lumps to use for each of the paint clumps, attached them with more fiberglas resin to the palette, then painted and sealed each of them. I painted to base to look a little like (I hoped) Florentine cobblestones, c. 1500. Then glued it all together. 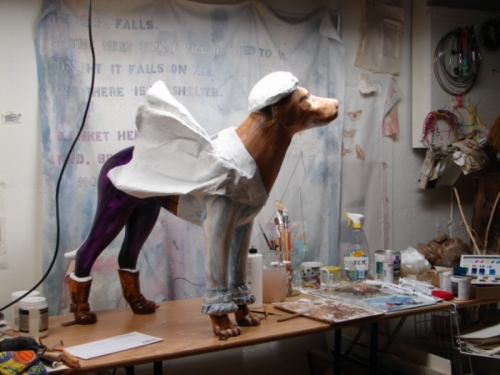 Before I placed the paint spots I needed to work out where the dog's feet would fall. 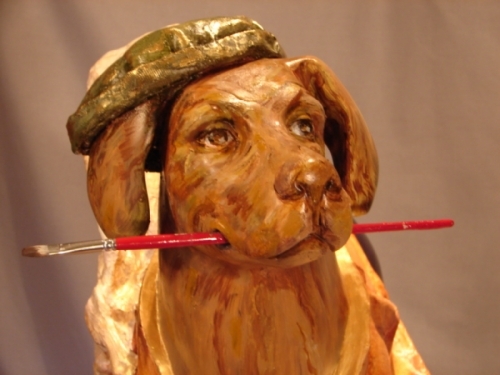 I grew very fond of this dog, in painting him. It had started out as a sort of merry joke, but something happened during those over a hundred hours of work. I wanted him to look thoughtful, and to convey that quality which one so often senses in talking with creative people, that his mind and attention were a little bit elsewhere, on something that I could not yet see, but he was listening to. 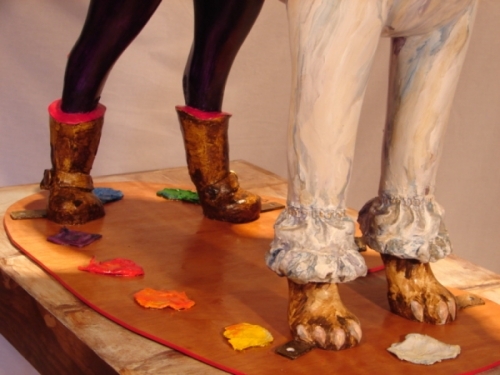 Leonardog was on display through the summer of 2008 at the Prairie Art Center, and was then auctioned at the fund-raising event. 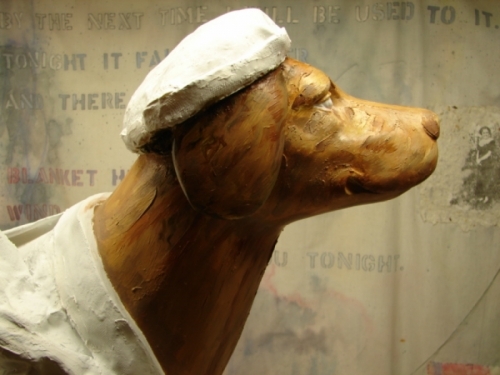 He now lives in Chicago, beside a column in the entrance hall of an apartment on State Street.